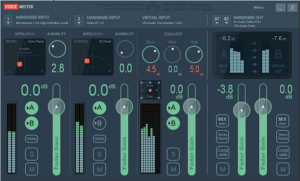 Developer VB-Audio Software has recently updated its audio production app Voicemeeter. Voicemeeter is a powerful software mixer for Windows that allows users to mix multiple hardware and virtual inputs. There are many possibilities for using Voicemeeter with podcasting. For example, Voicemeeter could be used to mix different sound sources such as USB headsets along with computer-based audio sources like software soundboards or media players. It could also be used for creating a mix-minus setup for recording Skype calls. *To mix your voice with your music on Skype or Google Voice as well as for broadcasting and make your own radio. *To use 2x USB Headset on a computer, for example for online educational program. *To Play Video Game in 5.1 and keep the MIC for communication with your team. *To make tutorial with your preferred audio software and pro quality. *To Record Conference or Interview in multichannel for post production. *To use different Audio Application together and record the performance in live with your preferred DAW. *Finally to manage simply whatever sound sources on your computer in an easy way. Voicemeeter is available as donationware. So, you can download and try the application for free. If you like it, the developer requests that you make a donation to encourage further development. Voicemeeter runs on most modern versions of Windows and doesn’t need a lot of processor power in order to operate. It’d be an interesting experiment to take a spare Windows machine and run Voicemeeter there to see how it could augment an existing podcasting rig. In some cases, I suspect a laptop running Voicemeeter could even replace a dedicated hardware mixer. There’s definitely some real potential here for different podcasting uses.